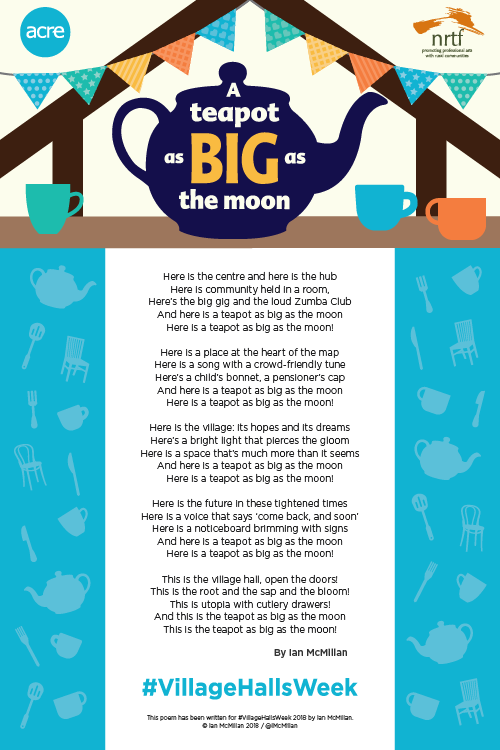 Read South Yorkshire Poet Ian McMillan (BBC 3) #VillageHallsWeek Poem “A Teapot as Big as the Moon”. CDA Herts is proud to be participating in this important event celebrating the work of our Village Halls in Hertfordshire. Without the hundreds of volunteers who give up many hours of their time on a weekly basis, these Halls could not continue to offer social, educational, health and recreational activities within their communities. CDA Herts has provided a support and advisory service to all Village Halls and Community Buildings in Hertfordshire for 50 years. Information and specialist advice is available for free for all Halls on all aspects of organising and managing their facilities. In addition we organise Network meetings and an Annual Conference to enable Hall Trustees to come together to learn the latest on legislation and regulation, hear about offers from service providers, pick up information, share best practice and solve problems. CDA Herts is promoting #VillageHallsWeek, starting Monday 22 January 2018, by encouraging our Halls to promote their activities locally through our website and social media and nationally through the ACRE network. Please use the links below to find out what is happening at your Village Hall during #VillageHallsWeek 22 – 25 January 2018.